As a kid I remember my grandmother insisting that I have five almonds everyday. She even gave the almonds to all the kids herself. While I did not understand it then, I do now as to why she insisted on all the children having almonds. She was not a graduate, but she sure knew about all the health benefits of almonds. 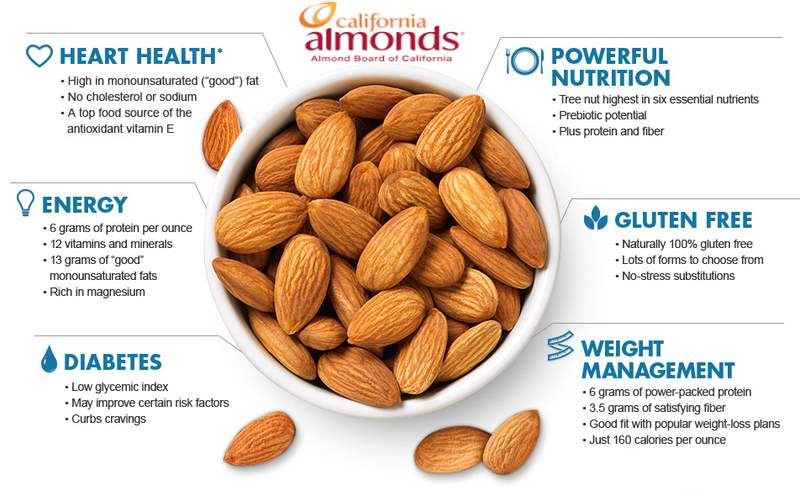 I am a diabetic, and a few years back when my cholesterol and triglycerides were going out of control, I remembered my grandmother and started having a handful of almonds daily. It also led me to research on the health benefits that almonds offer. Almonds are a very good source of polyunsaturated and monounsaturated oils, protein, magnesium, potassium, zinc, iron, and calcium. Apart from this, as is widely known, they are a superb source of Vitamin E. Just 28 grams of Almonds provides for 37% of the recommend daily intake of Vitamin E, and we all know how important Vitamin E is for good skin and healthy hair. Almonds are known to be antioxidants and it is largely concentrated in the skin of almond, so eating it whole is better than eating them blanched. Have a handful of roasted almonds instead of reaching out for that packet of fries or chips and you will not just improve on your nutrition but also loose weight. Research says that the monounsaturated fat present in almonds helps to satisfy the appetite as well as stops individuals from overeating. The heart benefit of almonds come from it’s being high in monounsaturated fats. A study established that consuming a variety of heart healthy foods which includes almonds can help decrease LDL cholesterol levels as much as statin medication. Individuals who consumed almonds lowered their total cholesterol by 5% and reduced their LDL cholesterol by almost 7%. By being low in carbs, high in healthy fats, protein and fiber and with it’s low hypoglycemic index, almonds help diabetics in satiating their hunger and reducing the carbohydrate cravings. Most type 2 diabetes patients are also deficient in magnesium and a few almonds daily can help in reducing this deficiency significantly, lowering blood sugar levels and improving the function of insulin. Benifits of almond post is very nice ,useful for everyone.